Definition: The ratio of torque to the weight of the moving part of an instrument is known as a torque/weight ratio. It indexes the performance of the instrument. The higher value of torque/weight ratio shows that the instrument has good performances. The value of torque/weight ratio of the moving part of the instrument should not be less than 0.1 if the deflecting torque acts as a force on the apparatus and shows the full-scale deflection. Let understand this with the help of the help of the example. Consider the indicating instrument shown in the figure below. If the weight of the instrument pointer is small, the instrument has high torque/weight ratio. The high value of the torque-weight ratio shows that even for the small value of deflecting torque, the pointer deflects and shows the measured value. 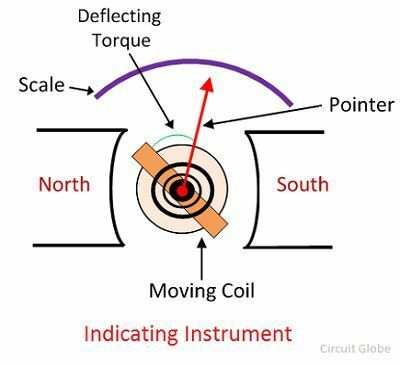 The frictional torque of an instrument depends on the weight of their moving part. The weight of the moving part is directly proportional to the frictional torque. The frictional torque is a type of rotational force caused by the friction between two objects. The frictional torque plays an important role in the performance of the instruments. The deflection of the pointer of an instrument depends on the fractional part of the frictional torque. The deflection torque will also depend on the direction in which the frictional torque applies. If the value of frictional torque is small as compared to the deflecting torque, the deflecting torque is completely neglected.